Online backups are all the rage these days, and for good reason too. Having all of your files securely stored far, far away from your own damaging hands will give you a certain peace of mind. After all, no one really likes to lose all of their pictures, music, and documents. There are a few different services for backing up to the cloud. Carbonite and Microsoft's own SkyDrive are good examples of this. There is a lesser known program that I have found to be extremely lightweight, fast, reliable, and best of all: cheap. 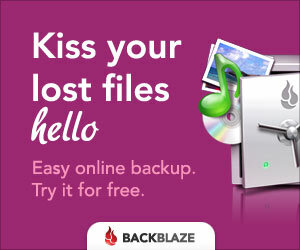 Backblaze is an online backup program that offers unlimited data backup for as low as about 4 bucks per year. So, you want in, or just to know more? Here you go!